Geneva used to have an airport? This was my question when I was trying to brainstorm exhibit ideas and my dad suggested doing one on the airport that used to be on Route 14S. And the answer is yes, Geneva used to have an airport and there were at least two others! 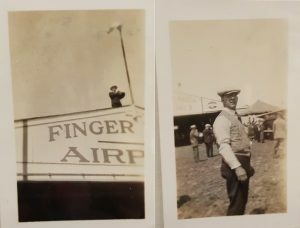 In the late 1920s, the Finger Lakes Airport on Canandaigua Rd. was a busy place for Genevans to take in the sight of small airplanes flying around the area. Additionally, there was discussion in 1928 about the airport becoming an emergency landing field for night-time air mail routes, much to the enthusiasm of the locals. 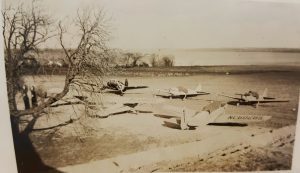 Though it was set to close in 1931, the airport remained open for another three months to be used for emergency landings before the land was reverted back to farm land. 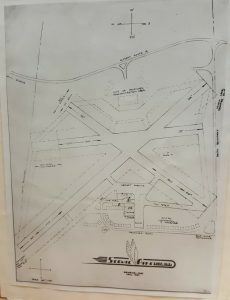 There were a few news articles from the Geneva Daily Times in 1933 which mentions the Dove Field Airport located on North Exchange Stret (near the Industrial Park on the east side of Exchange). Flying had begun by April 29 with the landing of a New Standard biplane flown by a navy pilot, which immediately was surrounded by “approximately 200 children,” and a month later a plane lost a wheel speeding down the runway to take off on a passenger hop. The field continued to be mentioned as a landing strip through 1938. Finally, ScenicAire Park, Inc. was established in 1946 by Hobart graduates John R Smingler, the founder, and Robert B Fraser, who would become the president of the corporation. The corporation held 450 acres of land where the current Glass Factory Bay resides on Seneca Lake near the Bayview subdivision. Interestingly, the expenses for the airport were funded by the dairy herd that was pastured and supported by farms in 300 of the 450 acres which also supported crops such as corn, oats, wheat, and red kidney beans. ScenicAire owned 6 aircraft, 2 Fairchild Cornells and 4 Piper Cubs, at the start of its life in 1946. 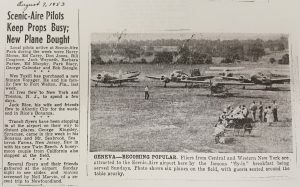 In their 1947 Prospectus, the founders expressed their reasons for choosing Geneva to build an airport as it was a growing city, it was centrally located in a “natural beauty area,” and it was a progressive city “except for its lack of air facilities.” They pointed out that having an airport in Geneva would only boost industry and help individuals as well as businesses thrive. 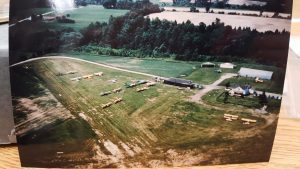 Operations for ScenicAire included sightseeing, pleasure trips, instruction, rental, and charter services when it first opened and the founders encouraged private flying clubs to make ScenicAire their home base. The founders described it as an ideal first gas and service stop for all westbound light plane traffic that originated in the New York City area. 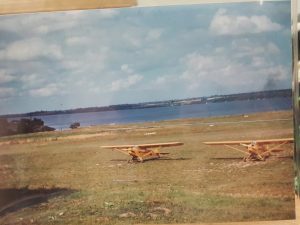 The founders make their wishes for the future clear in the Prospectus, their goals including an approved and licensed school of aviation would be opened in the spring, a horseback riding academy, new docks installed on the lake, and a nursery and play area built for children with a registered nurse in charge. The airport appears in the city directories until 1955. Though I haven’t created an exhibit out of this topic yet (so keep an eye on the small display at the Geneva Public Library), it seemed like a good opportunity to tackle it in this short blog article. Since my dad has been a small aircraft mechanic for longer than I’ve been alive it means I’ve been up in small helicopters and airplanes since I was old enough to be strapped into one. Seeing Seneca Lake from the air, especially in the fall, is such a gorgeous view; I highly suggest for anyone to have that experience at least once in their life.